Are you ready for the perfect Thanksgiving turkey? Are you sick of a dry turkey that you spent all day on? Or a turkey with rubbery skin that no one enjoys? What about slaving away on a turkey that no one eats and then you have tons of leftovers to do who knows what with? Well, I am here today, to share with you a recipe I have worked on perfecting over the years and it doesn’t take ANY fancy equipment! (Yes there is a smoking option for this, but it can be cooked easily in your oven and is still SUPER delicious). 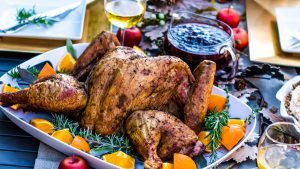 You will have a JUICY and flavorful turkey with skin so crispy people will think you deep fried it! You will impress everyone who comes to enjoy the feast you have prepared, even those who “don’t like the turkey”. Thanksgiving has always been my favorite holiday, mostly because I LOVE food and cooking and that is how I express/ show my love for people. I think because that’s how I grew up, my mom cooking delicious meals for us and I always felt her love through her cooking. Some of my favorite memories are of getting together with all our extended family, spending time with our cousins and having non-stop fun with them! Something I fondly remember is when my mom and aunt would put out bowls of black olives on the tables while dinner was getting cooked. We’d “sneak” around stealing the olives way before it was time to sit down… we thought we were so sneaky! Well, recently that memory came full circle. I was setting out our table spread and I put out bowls of black olives. Went back to working on some of the side dishes and when I glanced back at the table I saw my son Maverick (4 yrs) being very sneaky and stealing olives. He saw me watching him, then he giggled and ran away! Honestly seeing that almost brought me to tears but I also couldn’t hold in my laughter! I can’t complain because olives are good fats and I believe in eating all the good fats, so if the kids think they are being sneaky by eating them… well, I will continue to let them think they are getting away with it! So the first thing you need to know and prep for you start this turkey 4 days before you want to serve it (meaning it needs to be THAWED before then if you bought frozen). This might seem crazy to you, BUT on cook day it will ONLY take 2 hrs (or less) to cook it and there is literally NO work on cook day besides putting it in the oven/ smoker and then carving. So the secret to my turkey is dry aging/ brining. The seasoning mixture seasons the meat and leaving the turkey in the open refrigerated air helps to dry out the skin so that it crisps easier. When you spatchcock it, you create a more even cooking surface, so that the bird gets even exposure to the heat and you can cook it at a higher temperature and faster. This helps crisp the skin and keep it juicy inside. 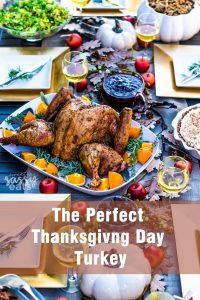 I’ve had so many people tell me “I thought I always hated turkey until I ate yours!” You will be the star of the show when you place this bird on your table this season! The one thing that you ABSOLUTELY need is a good meat thermometer, so you know the EXACT internal temperature of your turkey. This helps not make the mistake of an undercooked or overcooked bird! I recommend this Thermoworks instant-read thermometer or this Smoke Thermometer. The price may seem high, but you will use this so much in your kitchen and you won’t be replacing it a million times like you have to with the cheap inaccurate brands out there. Place the salt, sage, thyme, black peppercorns, and allspice into a spice grinder and pulse until the peppercorns and allspice are coarsely ground 5 to 6 pulses. Rub the seasoned salt on both sides of the turkey. 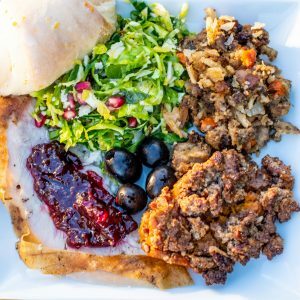 Place the turkey on a parchment paper-lined half sheet pan, breast-side up with legs running with the long side of the pan. Store, uncovered, in the refrigerator for 4 days. Remove the turkey from the refrigerator and leave at room temperature for 1 hour. Take ½ – 1 full stick of softened butter and spread all over the skin of the turkey. Get your smoker to 425/450 degrees. Place Turkey directly on grates and close the lid. Cook until you reach an internal temperature of 155 degrees in the thickest part of the breast. Remove from smoker and allow to rest for 15-20 min (cover with foil while resting). 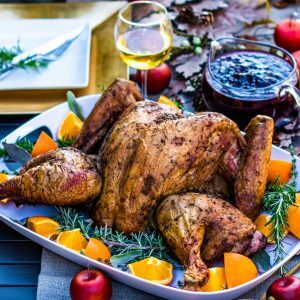 *If you want to make gravy from the drippings, place an aluminum foil pan under the grates where the turkey will sit before you heat your smoker. Place one rack in the middle of the oven and a second one far enough below so the roasting pan will fit. Heat the oven to 425 degrees F. Place the turkey directly on the middle rack of the oven with the legs perpendicular to the metal bars of the rack. Place a pan on the rack beneath the turkey to catch drippings. You can even add root veggies, potatoes etc to this pan if you want a side of root vegetable to accompany your meal. They will roast and be flavored by the drippings. OR if you want to make a delicious gravy, add the neck and giblets to this pan to collect drippings for your gravy. Roast for 30min. Reduce the heat to 350 degrees F. Continue to roast the turkey until a probe thermometer inserted into the thickest part of the breast registers 155 degrees F, an additional 40 to 50 minutes. Carve the turkey with an electric knife & serve. Ever dream of a turkey with super crispy skin but still super juicy meat? What about not spending the WHOLE DAY cooking said turkey? Well with my foolproof method you can have both things and a turkey cooked in less than 2 hrs! Set the turkey, breast-side down, on a large cutting board with the tail closest to you. Use an electric knife or heavy-duty kitchen shears to cut up one side of the backbone. Turn the bird around and cut back down the other side of the spine. Reserve the backbone for Bone Broth. Discard any fat pockets or excess skin found inside the turkey. Turn the turkey breast-side up and use the heel of your hands to press down on both breasts, until you hear a cracking sound and the bird has flattened slightly. Remove the turkey from the refrigerator and leave at room temperature for 1 hour. Rub Turkey down with softened room temperature butter. Get your smoker to 425/450 degrees. Place Turkey directly on grates and close the lid. Cook until you reach an internal temperature of 155 degrees in the thickest part of the breast. Remove from smoker and allow to rest for 15-20 min (cover with foil while resting). 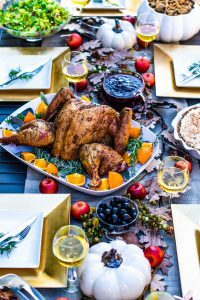 *If you want to make gravy from the drippings, place an aluminum foil pan under the grates where the turkey will sit before you heat your smoker. Place one rack in the middle of the oven and a second one far enough below so the roasting pan will fit. Heat the oven to 425 degrees F. Place the turkey directly on the middle rack of the oven with the legs perpendicular to the metal bars of the reaches. Place a pan on the rack beneath the turkey to catch drippings. You can even add root veggies, potatoes etc to this pan if you want a side of root vegetable to accompany your meal. They will roast and be flavored by the drippings. OR if you want to make a delicious gravy, add the neck and giblets to this pan to collect drippings for your gravy. Roast for 30min. I’ve made up my mind to try this for Thanksgiving. I’ve only ever done a wet brine before. No rinsing is required before the final prep for the dry brine? Hey Rhianna! I am so excited you are trying this! NO, you do not need to rinse it; in fact, this would be a bad idea because it would introduce more moisture to your skin, which we are trying to avoid (so you get crispy skin). We want that skin to be DRY! Good Luck! Let me know if you have more questions… even on Thanksgiving day! I noticed you pulled the turkey at 155 degrees., but the USDA states 165 degrees. Can you please elaborate? Yes, when you pull the large bird from the heat, it doesn’t stop from cooking. It is called CARRY OVER cooking and if you pull it at 155, it will reach 165 after resting. This ensures a perfectly cooked bird without it getting overcooked. Hi!! Can’t wait to try! We are going to smoke ours, about how many hours should we plan for it to cook for? Hey Amber! I am SO EXCITED for you to try. As for time, there are so many factors that go into it. 1- the weight of your turkey 2- temperature outside and how well your smoker maintains temp 3- the type of smoker you use, as they cook differently. etc. So I would PLAN on it taking 2hrs on the smoker (if it is in the 17-20+ lb range) if it is smaller it will definitely go faster. My recent turkey that was 13lbs only took 45min. BUT the MOST IMPORTANT THING TO REMEMBER IS TEMPERATURE! Using a thermometer to monitor temp during the whole cook is important. I link to my favorite one in the post and using an instant-read to check other areas is important. If your turkey is done early, that’s ok! Cover with foil to keep warm, take time to make it look pretty and plate it (don’t forget to take a photo). If you are running slightly behind, well your guests can be patient! Good Luck and let me know how it goes! 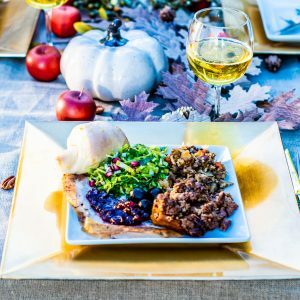 I know Thanksgiving has passed, but I got a turkey on sale and want to give this recipe a try! I’ll be cooking it in the oven. Your recipe says 12-14 lbs, but my turkey is 22 lbs. What adjustments should I make to the cook time and temperature? Hey Sam! I am so excited you are going to try this! So, with the dry brine (or rub) I would 1.5x the ingredients or close to that. As for cook time, I am assuming you are doing this in your oven, so still do the high roast for 30min, it really it to just help get the skin to begin crisping. When you drop the oven temp to 350 it will obviously take longer than the estimated 40-50 min. I NEVER set a timer for my meat. I cook to internal temperature. So the important part is to have a REALLY good thermometer. Preferably one that you stick in the bird and leave and can watch the temp without opening the oven. And then I always use an instant-read to check other areas. Given all this, when I have done this recipe with a 20lb+ bird It has taken about 2hrs of total oven time. SOMETIMES the skin can begin getting too dark; if that happens cover lightly with foil to keep the skin from burning before the meat is done. If you have more questions, let me know! In the post I link to MY FAVORITE thermometers if you don’t have one… you can also borrow mine if I am not cooking the day you decide to do it!